I bought a few comic books as a kid. I was never, however, a “collector.” But let me tell you, I met a few when I went to my first comic book convention. Comic City came to Nashville, Tenn., and set up for a three-day affair in the convention area of a local hotel. Now, by comic-book-convention standards, it was probably a rather modest affair. The Saturday afternoon I was there, there were probably less than 100 other attendees over the course of two hours, and maybe only a dozen exhibitors. Other, bigger conventions—like San Diego’s Comic Con or Chicago’s Comic & Entertainment Expo—are massive events attracting over 100,000 fans, hundreds of vendors, and TV and movie actors promoting their current or upcoming projects. Comic Con featured Dawn Wells, who played Mary Ann on Gilligan’s Island; she doesn’t have anything to do with comics, but she happens to be a Nashville resident. The other highlights were appearances by Sgt. Slaughter (Robert Remus), a semi-retired professional wrestler with an enormous jutting jaw who was later incorporated in the G.I Joe toy line, videogame and comic books; Doug Jones, a former contortionist who’s built up a formidable fan base by playing the Angel of Death in several movies based on the Hellboy comic franchise; various comic book and voiceover artists; and several other actors and actresses from TV (The Vampire Diaries, The Walking Dead) and movies (Child’s Play). Obviously, it wasn’t simply about comic books. Like other comic conventions, Comic City also included exhibits appealing to fans of horror, fantasy, animation, toys, collectible trading cards, games, videos and fantasy art. I met a very talented young artist, Ansley McDaniel, from Bowling Green, Ky., displaying her wide range of original fantasy-related work, which included a comic book (The Adventures of Sphinx-Cat, Vol. I), posters, cards, jewelry, and a line of sculpted resin dolls inspired by her childhood fascination with prehistoric creatures. 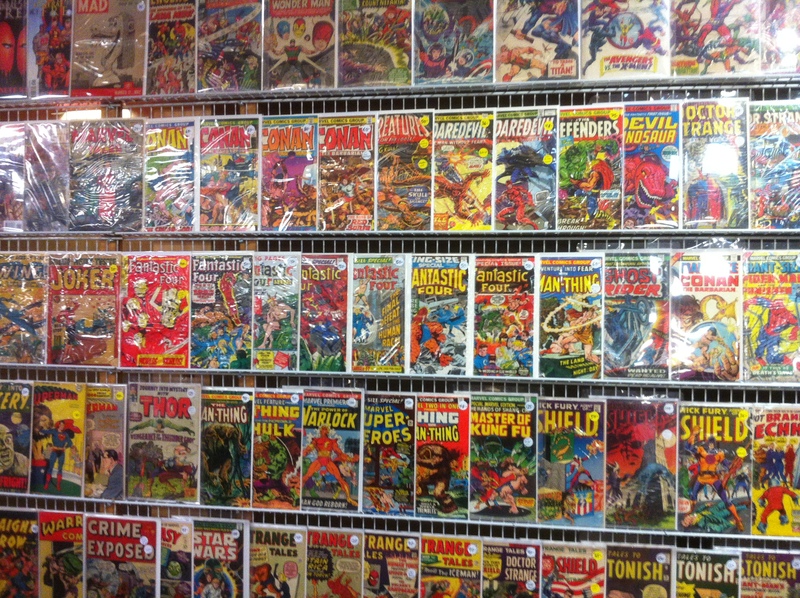 And, of course, I saw a lot of comic books, thousands of them, row upon row. Wow, who knew that the first issue of a 25-cent Donald Duck comic from the 1970s would sell for $75 today? 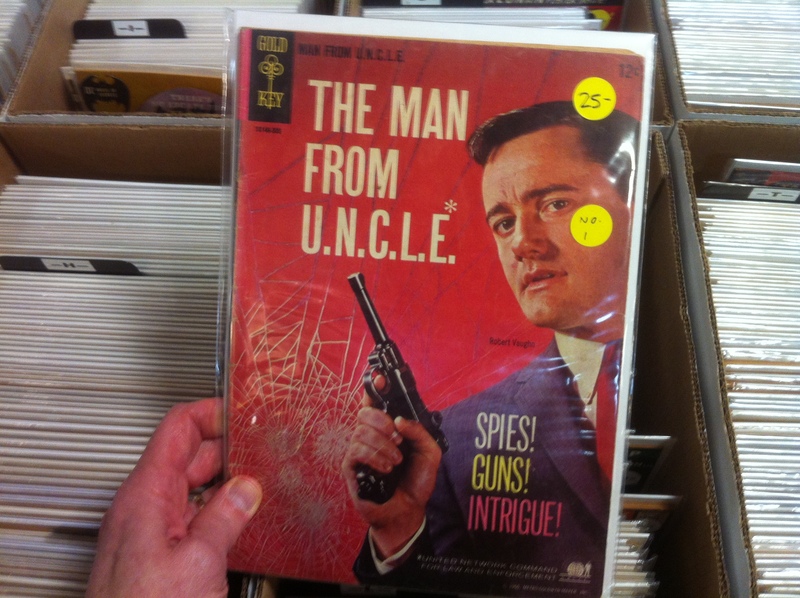 And I didn’t remember—but I wasn’t terribly surprised to discover—that someone made a comic book to accompany one of my favorite TV spy shows from the 1960s, The Man From U.N.C.L.E. 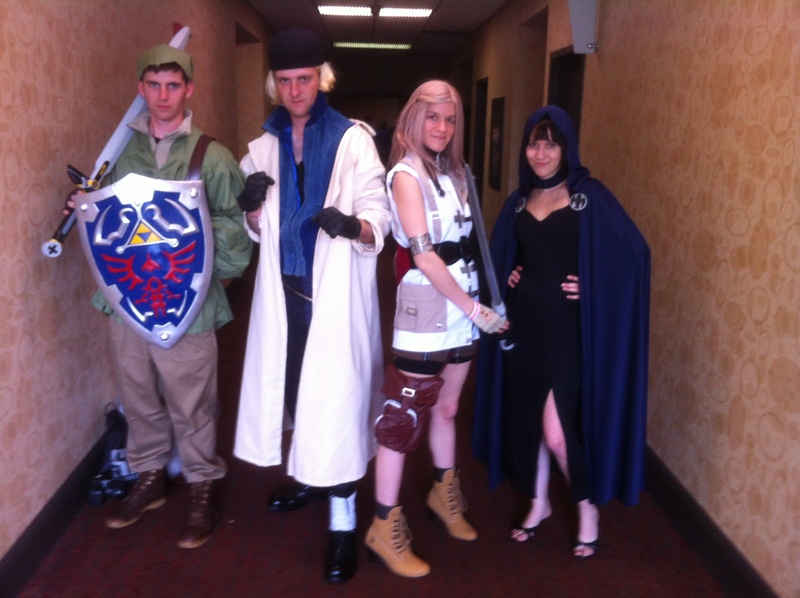 But as this comic convention revealed, these events aren’t just nostalgia trips, by any means. The median age of people I saw, both attending and exhibiting, was well below 40. 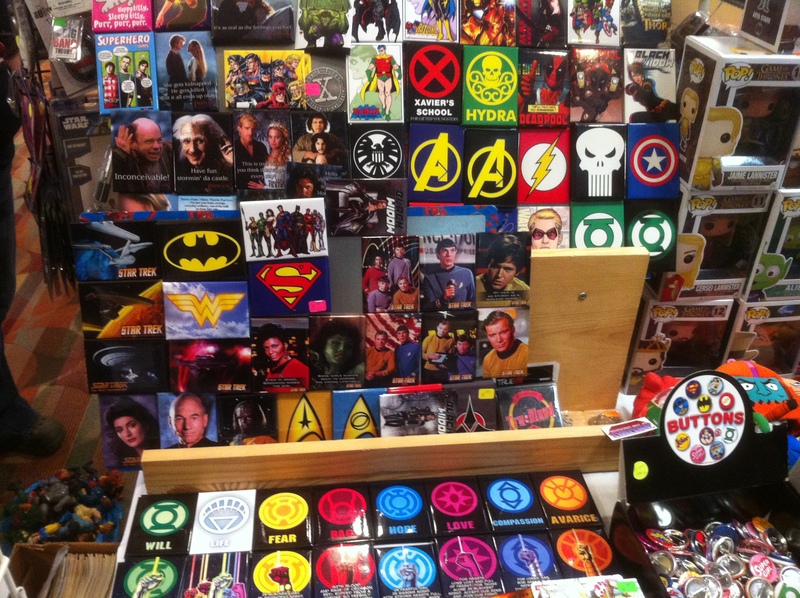 As one vendor explained, comics are timeless—and comic cons are hip. Just ask the four young costumed fans I encountered from nearby Clarksville, Tenn., dressed as characters from their favorite videogames. (That’s called “cosplay,” a mix of costume and play, in comic-con terminology.) They were all in their late teens or early 20s, and they said they were already veterans of several major conventions. Brian and Cody were both U.S. Army soldiers stationed at Fort Campbell; Bobbi and Michele were college students. Their costumes were homemade, and they said they never dressed up the same way twice. They loved coming to conventions, they said, to see other fans in their outfits, and to “meet the stars.” Their ultimate goal was one day to meet Marvel Comics creator Stan Lee. I won’t be at all surprised to run in Brian, Cody, Bobbi and Michelle (and hundreds of other excited folks) when a much bigger affair, the Wizard World Nashville Comic Con, comes to town Oct. 18-20, at Nashville’s brand-new sprawling Music City Center convention hall. Stan Lee is scheduled to be there, along with many other celebrities, including Henry “The Fonz” Winkler, Bruce Campell from The Evil Dead, Norman Reedus of TV’s The Walking Dead and Eliza Dushku from Buffy The Vampire Slayer. The Wizard World event will also host superstar comic artist and creators, including Neal Adams (Batman), Guy Gilchrist (Nancy), Mico Suayan (Wolverine) and Mike Grell (Green Lantern). In the meantime, back at Comic City out by the airport, Sgt. Slaughter was downstairs giving a talk about his wrestling days , Dawn Wells was smiling and signing autographed photos upstairs, and a new horror movie was just about to start showing in conference room B.